Visits: 44349 persons viewed this recipe. 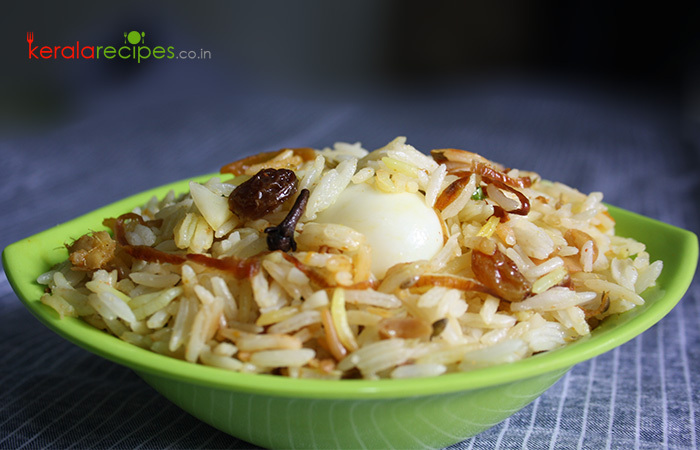 Egg biryani is one of the less time consuming variations of biryani. Though rich and flavourful, many casual cooks shy away from it due to the time that needs to go into its careful preparation. The Egg biryani presented here eases the pain and preparation time without compromising on the richness and satisfaction. Wash rice, soak in water for 30 minutes and drain it. Boil eggs in a vessel by adding water for 15 minutes. Peel away the shells and slice it into 2 halves. Chop ginger, garlic, tomatoes, carrot, capsicum, coriander leaves and mint leaves. Slice onions finely. Heat 1 table spoon of ghee in another cooking vessel, put cinnamon, cloves, cardamom & pepper and stir it. Put rice and stir for 1 minute. Pour 7 cups of hot water and salt as needed, cook it covered on a low flame. Remove from the flame when it is 90% cooked so that the rice does not stick together. Heat 1½ table spoon ghee in a cooking vessel, fry cashew nut, raisins and 2 finely sliced onion separately till golden brown and keep aside (while frying onions add 1 tea spoon sugar so that the fried onions remain crisp throughout). Heat 3 table spoon coconut oil in a vessel, put chopped ginger and garlic and stir it for 1 minute. Add remaining 3 finely sliced onions and carrot. Saute until the onions turn brown. Reduce the flame, add chilli, coriander, turmeric and garam masala powders into the vessel and stir it for 2 minutes. Proceed to add tomatoes, capsicum, curry leaves and salt to it and saute till done. Pour milk and combine well. Add sliced eggs into it when it starts boiling. Taste for salt and remove from the flame. Spread evenly 1 table spoon of ghee in a vessel and layer it with rice and the egg masala. Arrange 5 layers with rice and egg masala. The bottom layer and the top layer should be rice. Garnish each layer with fried onion, cashews, raisins, finely chopped coriander and mint leaves. Pour ½ table spoon Ghee on the top. Cover the vessel. Heat a heavy tawa, put the biryani vessel on the tawa and heat it in a very low flame for 15 minutes. Turn off the flame and let it unopened for another 10 minutes. Serve the egg biryani with salad, pappad and lime pickle. 1) Instead of cooking on a heavy tawa, you can also cook it in a pre-heated oven. 2) Salt can be added while boiling the eggs to prevent it from cracking. 3) Quantity of eggs can be decided as per the requirements. Hi Chilanka, Thank you very much for the feedback. Nice to know that you enjoyed it. very good recipe.. how to know the accurate cooking time? Thanks Smitha. The ‘dum’ process itself take minimum 25 minutes. Remaining steps can be done parallel. So it will take around 45 minutes for cooking and 15 minutes for preparation. I mentioned this time duration based on my trials. Please do share your findings if you happen to try this. Thank you. Hi Uma, Happy to know that you like the recipes posted here and also hope to see you here often. You can reach me at shaan@keralarecipes.co.in Thank you. The biriyani looks really appealing….. Which brand basmathi rice is used to make this biriyani…. the rice grains looks superb…. Hi Neha, thanks a lot for the comment. Sorry, I am remembering the brand name. I used some good quality long grain rice. In this recipe at which step we should put chopped garlic and ginger. Green chillie is missing or optional? Hi Raji, I am sorry, I missed to mention that in the step 6. It is updated now. Regarding green chilli, it is optional. Thanks a lot for the comment. Hi, This recipe is really good. Thanks for sharing with us. You are welcome Jiby. Thanks for the nice words. Hello Shaan, Thanks a lot for the recipe. I tried it yesterday. It came out really well. My Husband also liked it lots. Will try more dishes and definitely will leave a feedback for you. Anju, Thanks a lot for the feedback. I am also happy that you and your husband enjoyed it. Waiting for your feedback on other recipes. Have fun in the kitchen. I tried this recipe. It was Very Good Shaan. Thanks a lot Mini for trying this and also for leaving your feedback here. Hi Shaan, I have tried the egg biryani and it was yummy. Cooking is a nightmare to me, I don’t try any new dish. After the biryani was a success it increased my confidence. Thanks to you. Keep posting good recipes. Looking forward. It is tasty. My 5 years girl also liked it. Only thing is I don’t like ghee; so I just tasted it. Can you suggest any alternative for ghee?. Thank you for your effort. Best regards. Bala, Nice to know that you and your little girl love egg biryani. The alternative for ghee are hydrogenated vegetable oil (Dalda/Vanaspati), butter and cooking oils. Thank you very much for the feedback. It is very very tasty. Thank you sooo much. May I use coconut milk at the place of milk? Dhanya, Thank you very much for the feedback. You can use coconut milk as an alternative. Hi Shaan, I would like to know how to do the last process of egg biriyani in oven (@what temp and how long)instead of heavy tawa. Jean, You can set the temperature to 100 degree Celsius and cook it about 10 to 15 minutes. Very Good recipe. Green Chilli addition increases the taste.